Avoid if contemplating an acid trip … detail from Gladys Nilsson’s A Cold Mouth, which appears in How Chicago! Imagists 1960s and 70s. Photograph: courtesy the artist and Garth Greenan Gallery, New York via the "Guardian"
The recently opened exhibition titled How Chicago! Imagists 1960s & 70s at London's Goldsmiths Contemporary Centre for the Arts was recently reviewed by the Guardian and was also included in Art Newspaper's list of "Three exhibitions to see in London this weekend." The exhibit features the work of 14 SAIC alums including Roger Brown (BFA 1968, MFA 1970), Sarah Canright (BFA 1964), Jim Falconer (BFA 1965, HON 2016), Ed Flood (BFA 1967, MFA 1969), Art Green (BFA 1965, HON 2016), Philip Hanson (BFA 1969), Gladys Nilsson (BFA 1962, HON 2016), Jim Nutt (BFA 1967, HON 2016), Ed Paschke (BFA 1961, MFA 1970, HON 1990), Christina Ramberg (BFA 1968, MFA 1973), Suellen Rocca (BFA 1964, HON 2016), Barbara Rossi (MFA 1970), Karl Wirsum (BFA 1962, HON 2016), and Ray Yoshida (BFA 1953). 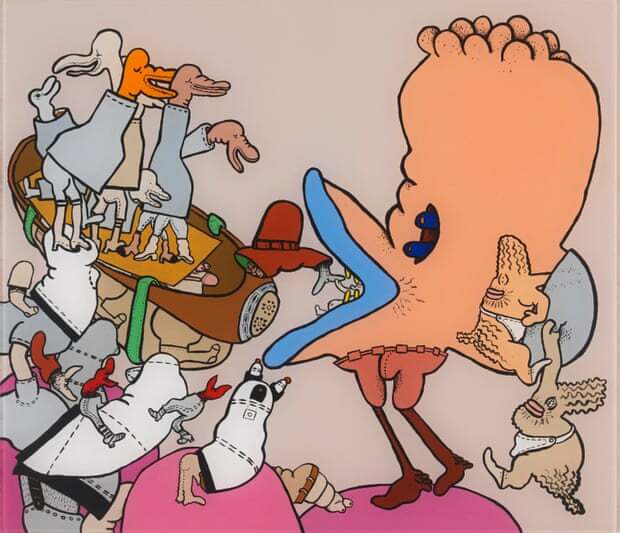 "The Imagists went their own way, largely oblivious to minimalism and post-minimalism, conceptual art and the last-gasp death throes of post-painterly abstraction. It was, and is, a Chicago thing," says the Guardian. Art Newspaper calls the exhibit, "... an ode to art school, the wonders of collaborative creation, the magic of a close-knit group who spent their formative years together."